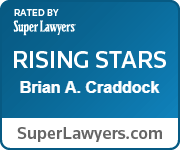 Brian Craddock, a Charlottesville native, concentrates his practice on business transactions. He advises business clients at all stages, specifically focusing on entity formation; mergers, acquisitions and divestitures; regulatory compliance; and drafting and negotiating commercial contracts. Brian has significant experience advising clients in heavily-regulated industries, including beverage, clinical trials, healthcare and government subcontracting. Brian lives in Crozet with his wife, Meaghan, and their young children. On weekends, he can be found sneaking out of the house before dawn with his chocolate Lab, Bear, to train retrievers, hunt waterfowl or fly fish.